If you have a large or transient workforce with a multi-access organisation, you need the security of an intelligent access control system along with the reassurance it brings. The HRX 5000 Proximity Terminal allows you to control movement and access, ensuring only the right people are allowed entry into the right areas. Designed to integrate with your Focus Time and Attendance system (Focus Pro or Focus Enterprise), the HRX Terminal is triggered by an employee’s unique proximity card. This card allows clocking in and out but has the added functionality of granting or denying access to any number of areas within your operation. A typical example might be a supermarket where controlled areas could include a tobacco and alcohol store within a food warehousing facility. The Terminal gives you the option to customise each individual employee’s or groups’ of employees access, right down to specific days and between specific time frames. Focus Access Control also links to your fire alarm, maintaining real-time monitoring of who is in which area of your premises at any given time. You can view Access Control reports recording who has been where, when and for how long. 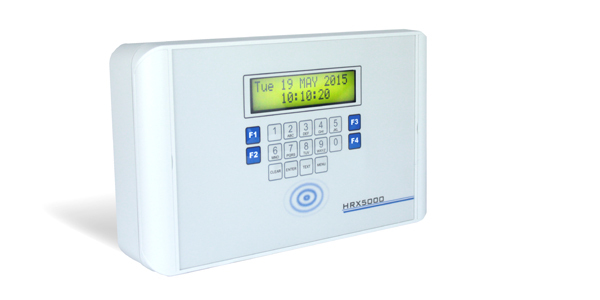 Each HRX 5000 terminal provides access control of up to two doors, barriers or turnstiles.